The events of the Lotus and Samurai story arcs of Legend of the Five Rings shook the Empire of Rokugan to its core. Toturi III's brave but ultimately futile quest for Enlightenment took him to the depths of the Shadowlands and led to his death in battle at the Tomb of the Seven Thunders. He left no clear heir, and his passing brought the short but dramatic life of the Toturi Dynasty to an end. The resulting power vacuum created a vortex, as the Great Clans maneuvered against each other in the absence of Imperial authority. Moto Chagatai, the Khan of the Unicorn Clan, took matters into his own hands and marched on Toshi Ranbo with the intent of claiming the throne, and only an alliance of other Great Clans stopped him and his powerful army in a battle that raged throughout the streets of the Imperial City. Summaries and timelines of events covered by Legend of the Five Rings CCG sets from Path of Hope through Glory of the Empire. New mechanics and NPC stat blocks relevant to those events. Adventure hooks and other suggestions for roleplaying in the Lotus and Samurai arcs. 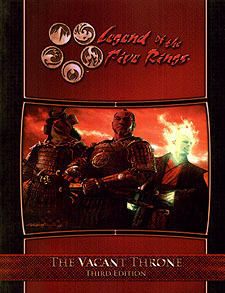 The Vacant Throne is a rules supplement and its use require the Legend of the Five Rings Rolplaying Game Third Edition core rulebook.